If your living anywhere in the United States, you have likely had to deal with plenty of that "white stuff" lately. What a winter this has been. Record snowfalls and ice storms. 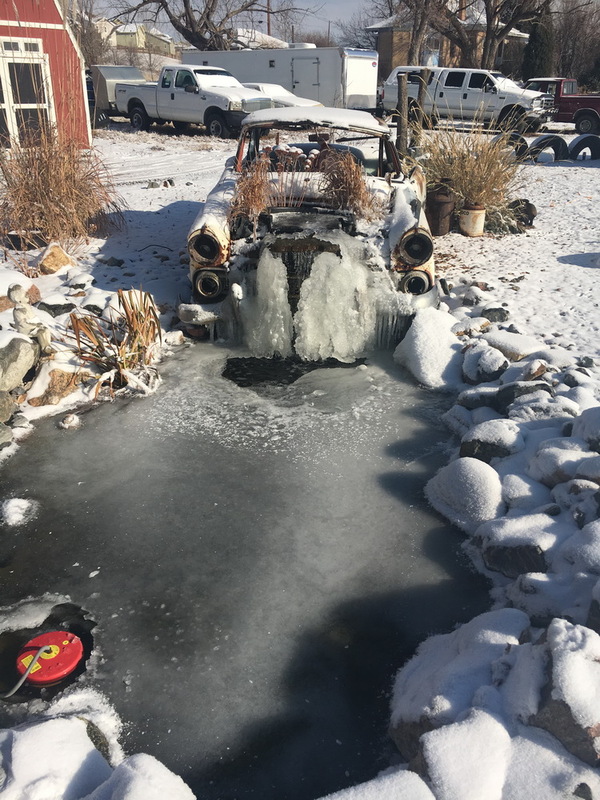 Even the ole car pond was a bit cranky! There is nothing you can do, but hunker down and make the best of it. For me it's the perfect time, to do some stitching in my sewing cave! This blog hop has a bit of a twist to it, as you may have heard. I've been collecting old jeans for years. It's about time I got the totes of them out and put them to good use! I find this, what I call "Mystery" fabric. Since it was half price and a remnant, I wasn't going to be out much if it didn't work, so I brought it home serged the edges, washed it in hot water and thru it in the dryer. It came out looking just like it did when I put it in the washer. but then, what do I know! This guy was a given! I haven't made a raggy quilt in a very long time. warmth and makes it"bloom" so nicely when it's washed. we all love in the winter. The boys do look happy don't they? If you haven't ever made a denim quilt, they are wonderfully warm. They wash up like a dream, and are heavy as heck. My arms were sure tired by the time I got this all put together. But it was well worth it when the temperatures dip down so low. ...watching TV at night, under my new quilt! If I can fight it away from the "Queen of the Castle", that is. Sharing is not her stong suit! Now there is a little lesson I learned through this process. That wonderful mystery fabric, does NOT like to be ironed. Don't ask me how I know, it's a nightmare I would rather forget. Trust me, you will thank me for this some day. Now for a couple of give aways. Want a new project to do? I've got a give away, also. has given me lots of fun patterns to share. This bundle will go to one of you lucky readers. I will pick the winner on Saturday, Jan 28th. Marian will select the wooly block kit winners, at the end of the hop. A big Thanks for Marian for making us think outside the box. 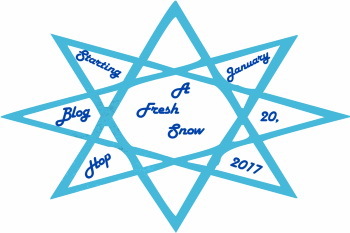 She works so hard to keep us in "stitches"
Be sure you check out my fellow bloggers and see just what snowy creations they have come up with for you! I found these when going thru that tub of jeans. They are probably size 3-T.
My boys are in their mid 30's now. OMG, I really need to clean out some stuff! Love your snowmen!! And the clipped denim between is great. Your denim snowman quilt is fabulous!! What a great idea! Thanks for the extra giveaway too. I just adore these snowmen! Your snowman quilt looks amazing!! I love it! Beautiful. I love raggedy quilts. Thanks for sharing. Love the quilt Joan. It is really adorable with the snowmen. Thank you for sharing today and for your giveaway. What a cute project!!! I love the snowmen and that you used "other" fabrics to create a quilt. My favorite part of winter? Everything! I love the snow, the cold, the shorter days. Taking a walk thru the winter woods on a mountainside, covered in snow, with no roads around, no sounds but the crunching of boots in the snow, that is my idea of heaven. It recharges and refreshes my soul. The trees look gorgeous covered in snow too. I am so delighted to live in Utah too. I bet your snowman quilt is nice and warm. And the cat always get's first pick of places to lay. Didn't you get that memo? May I refer you to my post today? Pretty kitty. Thanks for sharing. Love your quilt-great snowmen and a nice way to use jean material. It makes for a wonderfully warm quilt. My favorite part of winter is drinking hot chocolate by the fire. i love your snowmen, so cute and very creative. shows you how sturdy denim is!!! Favorite part of winter... when it's just barely snowed and white everywhere... there is just nothing like the beauty of it. wow your denim quilt is wonderful. LOL I have a bucket of jeans also. Need to use them. 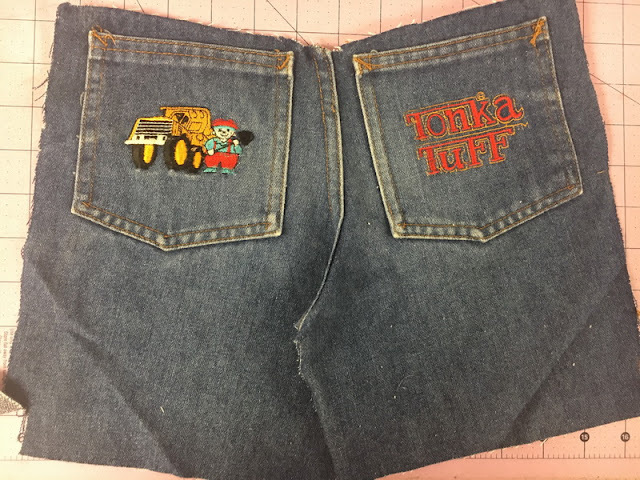 I love the Tonka truck jeans. what a cute skirt that would make. For Christmas my husband got me a ruler to use on denim. :) Now I have no excuse !! The denim quilt looks so soft - it must take a while to get such soft jeans - my son's are so stiff after washing! We have had an unusually snowy and cold winter for us. Now we seem to be back to normal. I hope it lasts as -10 Celsius with snow is really rude in the Pacific Northwest. How nice of your friend to share patterns with you and us. Thank you to that BFF. I love the first substantial snow! Those snowmen are just darling. We saw more snow than I wanted this past weekend so I am happy to be home from it. 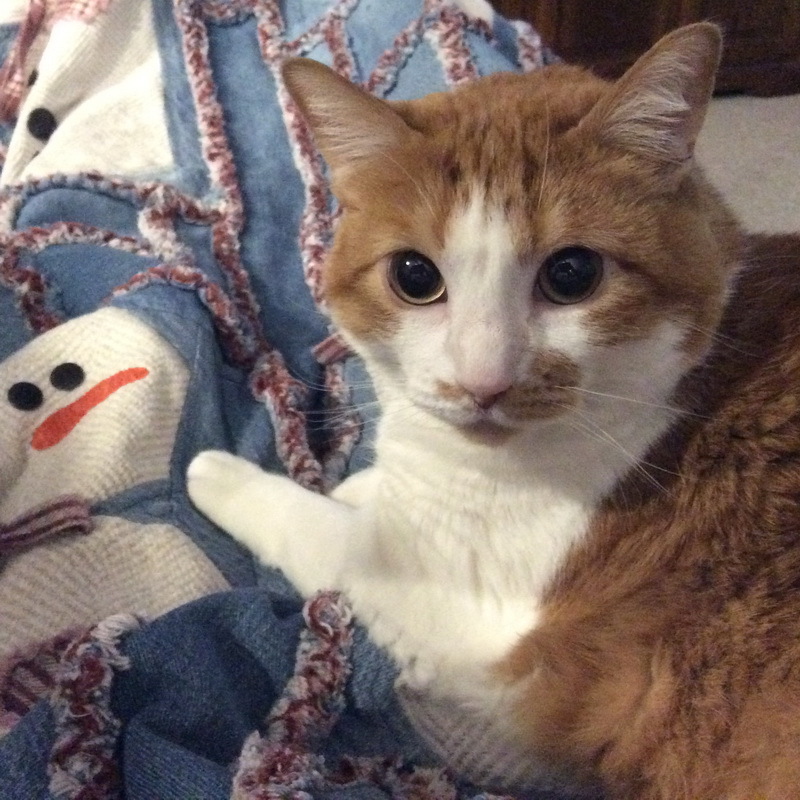 That is a really cute snowman quilt, thanks for sharing! I laughed when you showed the pockets and told how old your sons are. LOL That's great. We've been making emergency quilts in case we lose electricity in the winter. My friends are all done, and now it's my turn with the leftover jeans. On her daughters, she used pockets and embroidered parts from the legs, and it is just darling! These would be so cute in a pocket wallhanging - made like an advent calendar, maybe, so you could put things in the pockets. 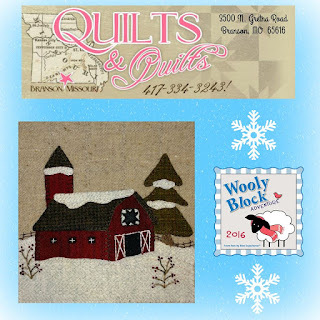 I love denim and flannel together, and your snowman quilt is adorable as well as warm looking! Thanks for more denim inspiration! And ha, my favorite part of winter is when it's over! Oops, Lol, I didn't answer the question about my favorite part of winter, hmm, when it's over? Lol It is a really good time to quilt. Thanks for sharing your denim quilt. 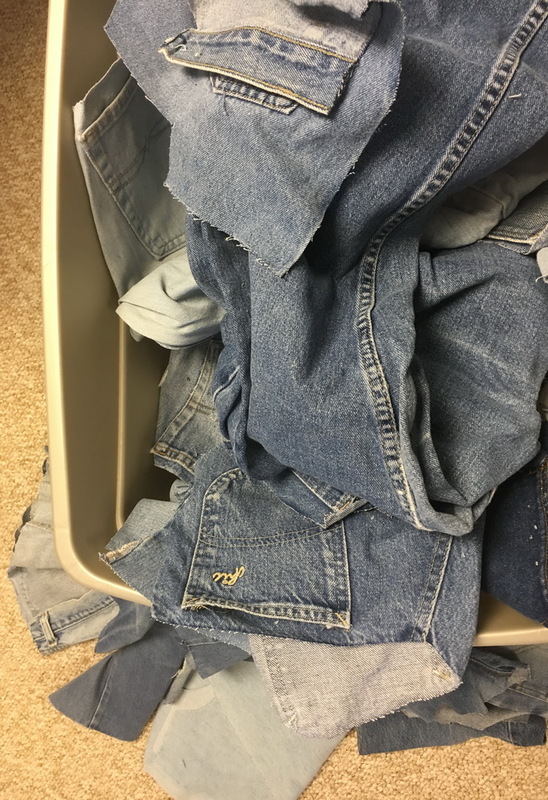 I have several totes full of jeans waiting for a project that never seems to come. This is a great inspiration. I have been following your blog for a couple of years now and you never disappoint, your imagination is awesome!!! This snowman/jeans quilt is perfect as is your sewing and quilting. My favorite part of winter is when I can stay in and sew. Thank you for such a great show-n-tell! I love the snowman rag quilt. Always fun to use new fabrics in quilts. Thanks for sharing. My favorite part of winter is when it is unseasonable warm with no snow. I have never made a rag quilt, but your snowman quilt looks perfect for winter snuggling! I love the heavy snow days when the snow blankets everything and turns the landscape into a quiet, serene winter wonderland. And, of course, I can snuggle with a quilt, a hot cup, and a novel! Fabulous! I love it! Beth at Words & Stitches. My favorite part of winter is when there is fresh snow on the ground.we haven't had a lot of that this season. Love your denim snowman quilt! What a great quilt, Kitty approved. My favorite part of winter is THE END of it! 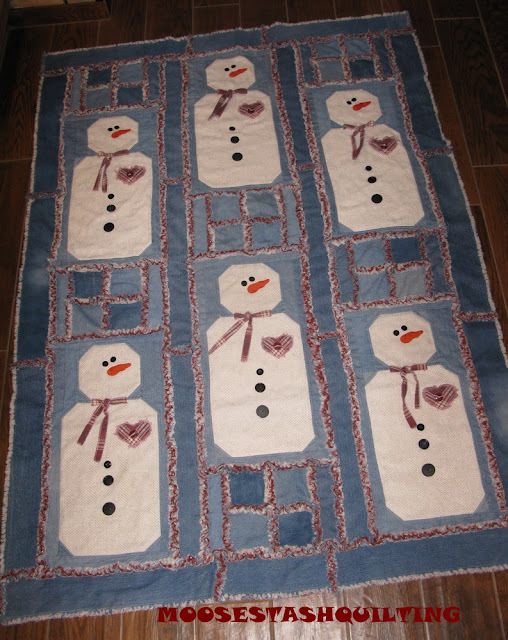 The snow man rag quilt is adorable! Great saving the jeans! Way to go! My favorite part of winter is snuggling in deep. But I like to do it in the summer time with the air conditioner on also! So I guess I like the foods! Cute snowmen! Lots of good ideas to cut up old worn jeans from three little boys! I love snowflakes and playing in the snow! I think my favourite part of winter is when it's over! LOL. I also like snowfalls that make the landscape pretty, but viewed from inside. You've inspired me to look for mystery fabric for my snowmen. 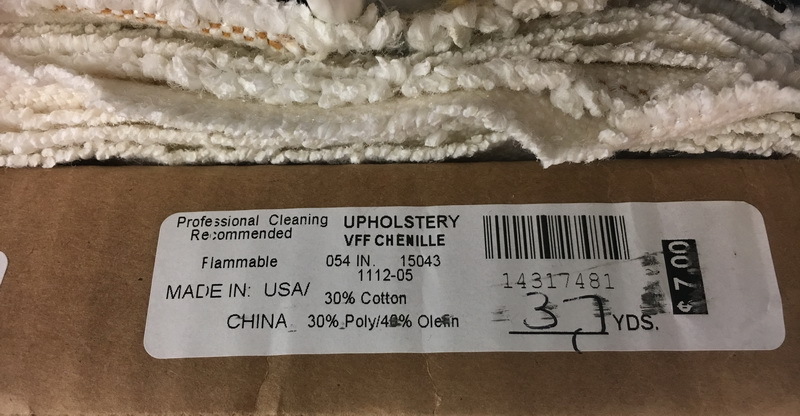 I can't seem to find white wool to felt in my local fabric stores. So cute, Joan!! Just love the snowmen. I have some jeans that I am going to work on a project with really soon. Can't wait after seeing your cute quilt. What a cute snowman Joan and isn't it fun sometime to work with mystery fabric!